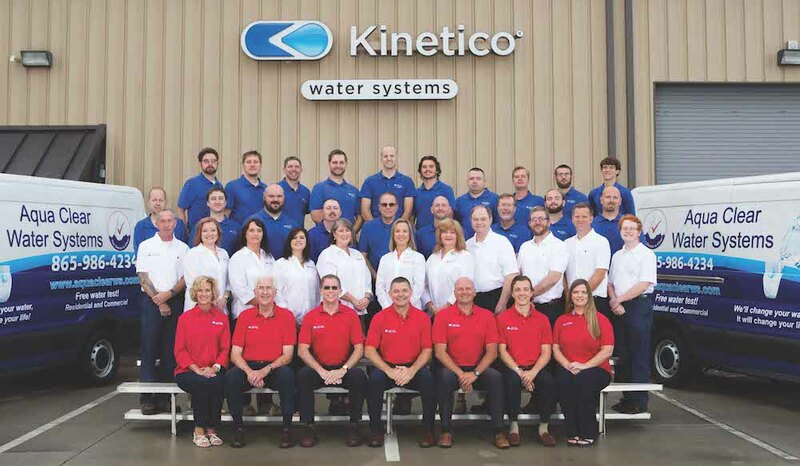 David and Krista Brewster entered the water industry almost by chance, but have since left their mark on their hometown of Lenoir City, Tenn., where Aqua Clear Water Systems is based. Now the vice president, Krista was a registered dietitian prior to the business’ launch in 2005 and David, the owner and president, was studying to become a pastor. David focused on his graduate studies during the day and worked in construction in the evenings. When he lost his job in the winter, a friend from his church who sold water softeners for Culligan reached out to him. He was moving and thought David might be a good fit for the role. After serving as a sales representative for a Culligan in Birmingham, Ala., for five years, David changed roles again to help a Hague water treatment dealer expand. David worked at that dealership for five more years; in the last two he tried to buy the business, but the owner was not willing to sell at the price David offered. Because of David’s relationship with the owner, he did not want to start a competing business in his territory. However, David and Krista were reluctant to leave Birmingham and uproot their family to a new community. David and Krista packed up their family and made the move back to their hometown of Lenoir City in March 2005, where the pair took steps to start their own dealership. Without a storefront at first, David worked out of his father’s basement and sold units door to door until he was able to rent a 1,300-sq-ft building. Now, 13 years later, Aqua Clear Water Systems occupies a 10,000-sq-ft building with a team of 45 employees. While the business now is a successful community staple, it almost went out of business twice in its early days of operation, David said. The first time, the company was fortunate to receive a large account of 18 bottleless water coolers to kickstart the fledgling business. The second time, the dealership’s parent company partnered with Home Depot, providing Aqua Clear Water Systems with the business of 18 local Home Depot stores. Of Aqua Clear Water Systems’ 45 employees, a number are family. Krista started working with the company part time in 2005, but now is the vice president full time. In addition, the couple’s oldest son, their niece and David’s sister all work for the business. Those who are not family are treated like it, as David and Krista ensure there is open communication among their employees. “Something else that makes us unique is that my wife cooks breakfast for the whole team most every Wednesday morning and we have a team meeting most Wednesday mornings at 7:30,” David said. Communication between departments provides educational opportunities to the company as a whole. In addition to the weekly breakfast meetings, the service and installation team has a meeting every morning to share challenges and lessons with one another. As a small business, Aqua Clear Water Systems offers competetive benefits, seeking to attract and maintain talent. David takes pride in the organization of the business’ warehouse and installation system. Every new piece of equipment is prepped in the warehouse every day, and every service team has a rolling cart with all the filters, ultraviolet bulbs and carbon filters pre-soaked and pre-flushed so there is no carbon dust when filters are changed, David said. Additionally, service technicians and installers have picture cards of every installation to ensure the installation is correct. David and Krista have made a name for themselves in the community they serve through word of mouth and quality service as their primary marketing tools. More than 50% of their business is from referral, Krista said. This is due in part to a competitive referral program the business offers to its customers. For referrals, customers have the opportunity to receive a percentage of the sale and the person they refer receives a gift. “You’d rather give it back to your customers than you would marketing or radio,” Krista said. Aqua Clear Water Systems further develops their customer relationships by following up with each customer, as long as they are within 60 miles of their office, for a retest of the equipment within four weeks of installation. This helps establish a customer relationship and provides field training to employees interested in sales. Beyond customer relationships, the business markets on the radio, at home shows and on their website. The city water has low total dissolved solids, ranging from 40 to 120 mg/L, and hardness of 2 to 8 grains per gal, according to David. However, well water in the area can create iron, hardness, sulfur and mud issues. The area also has high chlorine contents in drinking water and the business works to educate the community to water quality concerns. With bottled water on the rise, David thinks there has been an increased awareness regarding water quality issues in terms of both health and taste. He predicts the industry will continue to grow and improve as people become more educated and continue to experience the benefits of quality water.